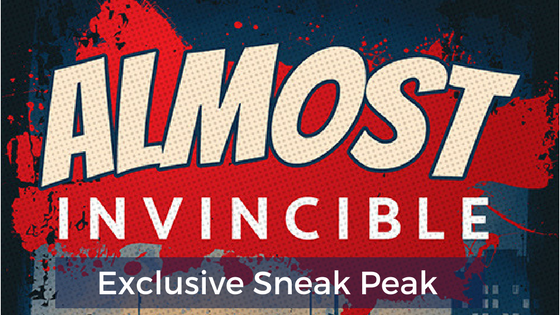 We’re two weeks away from Almost Invincible‘s September 30th release date, so to celebrate, here’s an exclusive sneak peak at the first chapter. Check it out and let me know what you think! My skull hit the pavement with a meaty crack, and my vision went blurry. As lightning pain shot through my head, it was all I could do to lie there wincing for several seconds. Eventually, I blinked and tried to refocus, my brain feeling like raw egg sloshing around inside my skull. But White Knight, said a voice in my head that sounded like a particularly annoying reporter who’d once interviewed me. You have super-strength. Surely, it couldn’t hurt that much. Yeah, I had super-strength, but that didn’t stop my nerve endings from sending pain signals to my brain, and right now, they were firing at a 110 percent. I pushed myself up dizzily and found the pavement smashed into pieces where I’d fallen. Okay, maybe it was a good thing I had superpowers. Otherwise, my head would have burst like a piñata on impact. Noise assaulted my ears: shrieking police sirens and the steady whump-whump-whump of helicopters overhead. I hoped they belonged to the government and not a news channel recording this horror show. Union Square came into focus as my vision cleared, eerily deserted for mid afternoon except for the corpses of those who hadn’t escaped in time. They were scattered across the grass and walkways, blood pooling on the plaza. The closest to me was a leg. It had belonged to a woman wearing sandals and was ripped off from the knee down, toenails painted light pink and fair skin splattered with more blood. The coppery stench saturated the muggy summer air. The Capitol Building stood proudly in the distance to my right, the turbid waters of the Capitol Reflecting Pool to my left, and twenty feet in front of me loomed the monster that had done this. Ten feet tall and composed of pale light that formed the shape of a man, he was difficult to see in the bright sunshine. That was problem number one. Problem number two was that nothing we’d done seemed to hurt him. Whatever he was, he’d shown up out of nowhere and hadn’t even made the traditional supervillain speech before destroying everything in his path. He moved fast for something so big, and he was currently advancing on a slender figure in a bright orange and blue uniform.